1 minute walk from Subway Awaza Station. 10 minutes drive from Honcho exit, Hanshin Expressway. Featuring a modern design and offering comfortable atmosphere, the Il Grande Umeda Hotel Osaka is an ideal place for you to reside. Located at Minami Morimachi near Umeda, the Il Grande Umeda Hotel is just 20 minutes from the Shin Osaka Station and a 30-minute drive from the Itami Airport. The hotel is also close to Osaka Castle Park, Osaka Tenmagu Shrine, Universal Studios Japan and Osaka Dome. Conveniently located in Shin-Osaka as a base for business and sightseeing. The public accommodation, which has 800-people capacity banquet hall (the largest in Shin-Osaka), independent chapel, and the Japanese and Western restaurants. 3 minutes by free shuttle bus (runs every 15 minutes). 3 minutes walk from Nihonbashi subway station, exit 7. It is located next door to the National Bunraku Theater, a 5-minute walk from Dotonbori, and a 10-minute walk from Nanba and Shinsaibashi. This hotel is utterly perfect for enjoying the theater, going shopping, or savoring gourmet delights. Nevertheless, the surroundings are quiet enough to allow you to relax and get some rest. Facilities include a banquet hall, restaurant, cafe, lounge, and karaoke bar. 2 minute walk from Subway Awaza Station. 20 minutes by taxi from JR Shin-Osaka Station or 15minutes from JR Osaka Station. Located in Nishi, this hotel is within a 15-minute walk of Utsubo Park and Osaka Science Museum. Shinsaibashi Shopping Arcade and Osaka Museum of History are also within 2 mi (3 km). Situated in Honmachi in the heart of Osaka, having convenient access to the shopping districts of Umeda and Namba also to the Osaka Dome. The site of the hotel is a quiet which is adjacent to the park and the tennis courts. All guest rooms are Non-smoking after 15th June 2016. If you are planning for an ideal holiday in Osaka, the Osaka Namba Washington Plaza is a perfect place for you to reside. The Osaka Namba Washington Plaza will entertain you with most convenient access to any city and downtown of Osaka. The property is placed at the entrance of Doton-bori, one of the most bustling areas with a variety of restaurants and shops, which is the most expedient for you to enjoy Osaka life. 3-minute walk from Kintetsu Osaka-Uehonmachi Station. 8-minute walk from Subway Tanimachi 9-chome Station. 5-minute drive from Takatsu/Yuhigaoka/Hoenzaka/Morinomiya IC on Hanshin Expressway. Kampo Yakuto (Chinese/herbal medicated bath) is popular among guests. The hotel is in a convenient location: walking distance to Osaka-Uehonmachi Station, New Kabukiza Theater, Osaka Conference Center, and Tsuruhashi town/15-20 minutes by train to Kyocera Dome Osaka and Osaka-jo Hall. Many restaurants and bars, drug stores, and hospitals are nearby. 4 minutes walk from Subway or Kintetsu-Line Nihonbashi Station. 4 minutes walk from Subway Nagahoribashi Station. Osaka Fujiya Hotel is located in the center of the city and within easy reach to the majority of tourist attractions and business addresses in Osaka. The hotel is the perfect to experience and explore this wonderful city. A full range of modern facilities are equipped in each of the 175 rooms. The underlying principles of the hotel are "safety, comfort and cleanliness"
Located in Kita, this hotel is within 1 mi (2 km) of HEP Five Shopping Mall and Umeda Sky Building. Osaka Science Museum and Mint Museum are also within 2 mi (3 km). Located in Shin-Osaka, this hotel is 1.7 mi (2.7 km) from Osaka Aquarium and 2.1 mi (3.4 km) from Umeda Sky Building. Universal Studios Japan and Giant Ferris Wheel are also within 2 mi (3 km). As a gateway of Osaka, the New Osaka Hotel is located just in front of Shin-Osaka Shinkansen station. Hotel is suitable for business and sightseeing accommodation, as well as having various kinds of parties, wedding banquets and exhibitions. Hotel building is a modern structure, having safety facilities and fine interiors to make your stay comfortable. 10 minutes walk from JR Osaka Station. 3 minutes by taxi from JR Osaka Station. The Hotel Hokke Club Osaka is located a 10-minute walk from Umeda, gateway to Osaka. Conveniently situated for getting to any location, the hotel is ideal for business and pleasure travelers. Hotel provides the comfort and warmth of home by cordial hospitality. Attention has been paid to ensure that everyone is able to stay relax and comfortable. A large observatory main bath on the 12th floor allows guests to relax and rest their weary bodies after a busy day. A few minutes walk from the subway Daikoku-cho station exit number 2 to the left, and around the left corner of the Moto-machi Sanchome intersection. 3 minutes by car from the JR Namba station. Rooms are equipped with microwave ovens and other appliancies which is ideal for long-term stays and allows guest to feel right at home. The check-out time is not till noon, allowing guests time to prepare their departure. The breakfasts are served free of charge with fresh bread from the famous "Oriental Bakery",coffea and tea. 1 minute walk from Subway Awaza Station. 50 minutes by bus from Kansai Airport, bound for Namba. 5 minutes by car from Shinanobashi exit on Hanshin expressway Higashi Osaka route. 1-minute walk from subway Awaza Station which makes a good access to any places in the city. Itachibori, the tool wholesalers district in our front, and Utsubo Park, famous for tennis and soccer on our back. It is also convenient to visit Kyosera dome Osaka, Intex Osaka the exhibition center, International conference hall and Osaka Municipal Central Gymnasium. Located in North Osaka, this hotel is 1.5 mi (2.4 km) from Open Air Museum of Old Farmhouses and within 6 mi (10 km) of Osaka Science Museum and Umeda Sky Building. Mint Museum and Umeda Arts Theater are also within 6 mi (10 km). This hotel is a stylish business-type hotel with a resort-style exterior and lobby. The uppermost floor houses the main bath with sauna attached. Guests are invited to feel at home. This is the base for business travelers and tourists. Hotel is located in 10 minutes walk from JR Osaka station, Umeda station on Hankyu line, Hanshin line and subway line. Business districts as Honmachi, Yodoya-bashi, Minamimori-machi are in the walking distance form the hotel. It even has a good access to Osaka Castle or Universal Studios JapanR. This Osaka apartment hotel is about 2 blocks from a metro station. Osaka Castle and Osaka Business Park are both 1 km (0.6 mi) from the hotel. The Umeda shopping district is 3 km (1.8 mi) away. 1 minute walk from Keihan railway Tenmabashi Station East exit. 1 minute walk from Subway Tenmabashi Station #3 Exit. Hotel Keihan Tenmabashi is conveniently located close to government district and adjacent to Osaka Castle. All rooms have free optical Wifi and LAN connection. Hotel is equipped with shower toilet and uses negative ion water which has beauty and health benefits. 5 minutes walk from Nihonbashi subway station. As the Hotel Kuramoto is situated a 3-minute walk from the bustling streets of the Minami area of Osaka in a quiet residential area, guests can fully savor the bustling delights of this part of town before resting in a leisurely setting. All rooms are equipped with a bathtub and toilet. A large bath in which guests can relax in contentment is located on the first floor to assist in alleviating the fatigue of the journey and of play. Featuring convenient location, warm welcome and a pleasant ambience, the hotel provides all the comforts to make your stay relaxed. The hotel is located near the Minami Morimachi Metro Station, on the eastside of central Osaka, Umeda. Centrally positioned, this property is a kilometre away from the railway station and 60 kilometres from the airport. 1 minute walk from Tanimachi Yonchome subway station #4 exit. Single rooms are equipped with double-sized beds and bathrooms offer plenty of space to enable guests to settle down and relax. Hakuyo, a Chinese restaurant serving authentic Cantonese cuisine, incorporates a pale color scheme in its interior design and guests are invited to savor their meals in a relaxing atmosphere. Located in Chuo, this hotel is within 1 mi (2 km) of Hope Chapel Osaka and Shinsaibashi Shopping Arcade. Osaka Science Museum and Osaka Museum of History are also within 2 mi (3 km). 3 minutes' walk from Keihan Nakanoshima Station. 7 minutes' walk from the 9th exit of Awaza Station on the Sennichimae Line. 5 minutes' drive from the Nakanoshima-nishi Exit of the Route 3 Kobe Line. The Hotel NCB, which is in Nakanoshima, is very convenient access to transportation systems. Hotel parking lot has space for 80 cars and they are monitored for 24 hours. It is 3 miniutes' walking distance to Osaka International Convention Center where conference and concert are held. Enjoy sightseeing for the Kansai areas! Located in Shin-Osaka, this hotel is 1.9 mi (3 km) from Umeda Arts Theater and 2.3 mi (3.6 km) from Umeda Sky Building. Osaka Museum of Housing and Living and Grand Front Osaka Mall are also within 3 mi (5 km). 2 minutes walk from Subway Nishi- Nakajima Minamigata Staion on the Midosuji Line. Shin-Osaka Sunny Stone Hotel is located only one station away from JR Shin- Osaka Station and only 5 minutes away from Subway Umeda station. It is an easy access to Shinsaisaibashi and Namba by subway and it allows easy access around the city. The lobby is bright and clean, and room is simple to be relaxed. Patrolled by security guards at night for safety, it is pleased by the ladies traveling alone. Located in Amerikamura, this hotel is within 1 mi (2 km) of Hope Chapel Osaka and Shinsaibashi Shopping Arcade. Osaka Science Museum and Osaka Museum of History are also within 2 mi (3 km). New Osaka Hotel Shinsaibashi is featuring a European style interior and a resort-like ambience, but rates are reasonable. Hotel is located a 3-minute walk from Subway Shinsaibashi Station in the Minami area of Osaka and gives guests a chance to fully enjoy themselves during their off-times while remaining suitable for business travelers! A ladies floor and non-smoking floor are available. Located in Shin-Osaka, this hotel is within 3 mi (5 km) of Umeda Arts Theater, Open Air Museum of Old Farmhouses, and Umeda Sky Building. Hattori Ryokuchi Park and Osaka Museum of Housing and Living are also within 3 mi (5 km). Offering convenient facilities and comforts, Hotel The Lutheran Osaka is an ideal place for a pleasant as well as a relaxing stay. Conveniently located near Tanimachi 4-Chome Metro Station, Hotel The Lutheran is placed within walking distance from Osaka Castle. The city is well known as one of business districts in Osaka and there is Osaka Prefectural Government and Passport Office near the hotel. 6 minutes walk from Shinsaibashi station. Connected to Nagahoribashi Subway Station. 20 minutes by taxi from JR Shin-Osaka Station. 5 minutes from Dotonbori exit on Hanshin Expressway, en route Sakaisuji. Presenting cosy lodging and services, the Ark Hotel Osaka is an ideal place to spend an exciting holiday. The Ark Hotel Osaka is located in the centre of Osaka and is close to Namba, an exciting area that sends a new culture nation-wide and Hommachi which is the centre of Osakan business. The property is only an hour away by train from the Osaka Airport and the Kansai International Airport. 3 minutes walk from Yodoyabashi station on subway Midosuji line, No.12 exit. 10 minutes by car from Honmachi exit on Hanshin expressway. Renovated in 2008, located in the center of Osaka with a 3-minute walking distance from Yodoyabashi station on subway Nidosuji line and 30 minutes to Universal Studios Japan. We also have a good access to Kita and Minami which is good for business and sightseeing. Located near the Osaka Castle, this property with cosy accommodation is an ideal place for a pleasant and enjoyable stay. Overlooking the Okawa River, the Castle Hotel stands on the Osaka side and is just a 2-minute walk from Tanmabashi and 20 minutes from Shin-Osaka Train Station. The hotel has an easy access to all the major attractions of the city as well as the neighbouring Kyoto City. Presenting impeccable lodging and hospitality, the Metro 21 Hotel is an ideal base to stay in Osaka. Situated in the centre of the city, the Metro 21 Hotel Osaka is just a 5-minute walk from Nipponbashi Station and 20 minutes drive from the Shin-Osaka Station. 10 minutes walk from JR Osaka Station. 5 minutes walk from JR Kita Shinchi station. 5 minutes walk from Subway Nishi-Umeda Station. 1 minute by car from Deiribashi on Hanshin express NO.11 Ikeda route. Hotel Vista Premio Dojima is the first appearance in Kansai with new sense of space and serenity in the hustle and bustle of the city. Hotel offers a high quality relaxation time. 5 minutes walk from JR Osaka Station. 5 minutes walk from Subway Umeda Station. Umeda OS Hotel is located at Higashi Umeda Subway Station and faces the main street, Midosuji. It is convenient for both business travelers and tourists. THe hotel is about 5 minutes walk from JR Osaka Station and department stores and commercial establishment stand near by. It is an advantage to enjoy shopping from morning to night. Giving a spacious feel and cosy atmosphere, the East Hotel Osaka invites you to spend an enjoyable stay in Osaka. The East Hotel Osaka is located just 7 minutes from Yodoyabashi Station and only 10 minutes from Umeda Station. The airport is about 50 kilometres from the hotel. 1 minute walk from Subway Nagahori Station. 5 minutes walk from Subway Shinsaibashi Station. 10 minutes drive from Dotonbori IC, Hanshin Expressway. Located in Chuo, this hotel is within a 10-minute walk of Hope Chapel Osaka and Shinsaibashi Shopping Arcade. Osaka Science Museum and Osaka Museum of History are also within 2 mi (3 km). A large-scale, multi-purpose business hotel situated in Shinsaibashi, the heart of Osaka. Please take advantage of the convenient accessibility of this hotel as a base for business or sightseeing. The hotel is a 2-minute walk from Exit 7 of Shinsaibashi Station on the Midosuji Subway Line, 15-minute walk from Shin Osaka subway station, and 1 hour from Kansai International airport. Located in Amerikamura, this hotel is within a 5-minute walk of America Village and Shinsaibashi Shopping Arcade. Osaka Science Museum and Tsutenkaku Tower are also within 2 mi (3 km). Hotel has an easy access to Osaka castle, Osaka Aquarium KAIYUKAN and other sightseeing places as well as shopping sites of Dotonbori. All rooms are equipped with free internet connection, beds are supplyed by famous bed maker Simmons Co.,Ltd., and shower toilet. 1 minute walk from Suminoe Koen station on subway Yotsubashi line. 10 minutes by car from Tamade exit on Hanshin expressway Sakai route. Free fresh brew coffee available at the lobby for 24 hours, free massage chair in the relaxation room, free laundry corner, 50% of the guest rooms are non-smoking, 1 minute walk from Suminoe-Koen station No.5 exit, good view from the guest rooms above 10th floor. A gym, medical center and shops are on the 1st to 8th floors. 30 minutes by shuttle bus (Osaka city bus) to USJ station. 5 minutes walk from Kitashinchi station on the JR Tozai Line. 10 minutes walk from JR Osaka station. 7 minutes by car from Umeda exit on Hanshin expressway. Non-smoking hotel. 5 minutes walk from JR Kitashinchi station on Tozai line. Located in the center of the business district and surrounded by high brand shops, and amusement facilities of the Nishi Umeda area. The hotel can be a base for for business, sightseeing and shopping. 5 minutes walk from Shin-Osaka station on JR Shinkansen/Subway Midosuji line. 25 minutes by car from Suita IC on No.2 national road (central loop line). Opened in 2012 by Hankyu Hanshin DAiichi Hotel Group, in the Shin-Osaka Hankyu building with the concept of "sound sleep". Directly connected to JR/subway Shin-Osaka station. The hotel offers our original designed beds, rain-style showers and massage chairs to ensure guests the sound sleep and comfortable stay. 2 minutes walk from subway Nakatsu station on Midosuji Line. 5 minutes by car from Umeda exit on Hanshin expressway Ikeda route. 5 minutes walk from Shinsaibashi Station on subway Midosuji Line. 4 minutes walk from Nagahoribashi station on subway Sakaisuji line. 7 minuets by car from Honmachi exit on Hanshin expressway. Located in Minami-Senba, north of Shinsaibashi with its luxury goods shops and boutiques. Also Amerika-mura and Dotonbori are walking distance. Free internet access is available in all spacious guest rooms. Other amenities include wired-broadcast (440 ch), LCD televisions and bidet-toilets. We have business facilities and coin-operated washing machines. Located in Kita, this hotel is within a 15-minute walk of Osaka Station City and Umeda Sky Building. Osaka Science Museum and Osaka Castle are also within 3 mi (5 km). Situated 4-minute walk from JR Osaka Station, Hearton Hotel Nishi-Umeda is ideal for business and perfect as a base for sightseers wishing to travel to Kyoto, Kobe, and Nara. Despite being an economy hotel, guest rooms are a bit on the spacious side and reliable security is offered such that groups of female travelers can feel safe in making the decision to stay here. An airport limousine bus service picks up passengers at a nearby stop and guests are given plenty of time to check out. Offering a favourable location and relaxing atmosphere, this attractive property is the right choice of accommodation, while visiting Osaka. Located a kilometre from the city centre, the Sunroute Umeda Hotel is 10 minutes walk from the JR Osaka Train Station and 45 kilometres from the airport. Located in Nishi, this hotel is within a 10-minute walk of Festival Hall and Osaka Science Museum. Umeda Sky Building and Shinsaibashi Shopping Arcade are also within 2 mi (3 km). Rihga Nakanoshima inn is located just above the subway Higobashi station, also 5-minute walking distance to Yodoyabashi subway station. All rooms are equipped with liquid crystal TV and free internet LAN. There are non-smoking rooms, ladies' floor and 24-hour convenience store on the 1st floor. 1 minute walk from Yodoyabashi Station No. 12 exit on Subway Midosuji Line. Hotel Unizo Osaka Yodoyabashi is located 1 minute walk from Yodoyabashi Station No. 12 exit on Subway Midosuji Line, the main artery of Osaka in Osaka. It is good access to Shin-Osaka, Umeda, Namba and even Kyoto by 50 minutes. It pursues the quality of hospitality and offers the peacefulness which remains in all the visitors' heart. about 2 minutes walk from Shinsaibashi Station. No transfer from Shin Osaka/Osaka (Umeda) stations by subway to the hotel! Located in the center of Minami district. Also no transfer to the Kyocera Dome Osaka by subway. Suitable for the business and sightseeing. 3 minutes walk from subway Yotsubashi Station. 8 minutes walk from subway Shinsaibashi station. 5 minutes walk from subway Honmachi Station. 3 minutes by car from Shinanobashi on Hanshin express loop route. Renovated in 2012. Free wireless/wired LAN are available in the hotel. Located in the center of the Osaka city, having convenient access to 3 subway stations in walking distance. You can spend peaceful time in the hotel even in the mid-city. Rooms are spacious and comfortable. Located in Namba, this hotel is within a 15-minute walk of Sennichimae Doguyasuji Shopping Street and Tsutenkaku Tower. Shitennoji Temple and Shinsaibashi Shopping Arcade are also within 1 mi (2 km). Chisun Inn Osaka Honmachi is located at Honmachi and Semba area, which is the business district representing Osaka and convenient for various transportation access. With bright and friendly service, it provides the visitors of both business and sightseeing the comfortable stay. Located in Osaka Castle, this spa hotel is within 1 mi (2 km) of Kema Sakuranomiya Park, Osaka Castle, and Mint Museum. Osaka Science Museum and Osaka Museum of History are also within 3 mi (5 km). Convenient location to Osaka and Kyoto for business and sightseeing purpose. Greenery Osaka Castle Park is adjacent to the hotel. We have 3 restaurants, natural hot spring bath, and beauty salon. Offering convenient facilities and comforts, Tokyu Inn Osaka is an ideal place for a pleasant as well as a relaxing stay. Situated at Umeda, the north centre of Osaka, Tokyu Inn Osaka is convenient for business and leisure. Placed just 30 minutes from Kyoto and Kobe, this property is only an hour's journey from Nara by train. 1 minute walk from Universal City station. Located in Konohana, this hotel is within a 5-minute walk of Osaka Takoyaki Museum and Universal CityWalkR Osaka. Universal Studios JapanR and Sanja Shrine are also within 3 mi (5 km)Hotel Universal Port is a resort and entertainment hotel situated next to Universal Studios JapanTM. 2 minutes walk from Esaka station on subway Midosuji line. 10 minutes by car from Toyonaka IC on Meishin expressway. Situated in the northern area of Osaka and in the heart of the business district. There are Hattori-Ryokuchi, Expo Park, Minoh Falls, and other attractions where you can feel the natural seasons all through the year. In the hotel, there are free large communal bath and sauna which make you relaxed. (Times for men and women are scheduled.) Access to the hotel is convenient, 5 minutes by subway from Shi Osaka station, 15 minutes by taxi from Osaka Airport. 6 minutes walk from Subway Shinsaibashi Station, using #2 exit. 1 minute walk from Subway Nagahoribashi Station, using 5A exit. Best Western Hotel Fino Osaka Shinsaibashi is located within walking distance to Minami, the southern heart of Osaka. This premium business hotel is ideal for both business and sightseeing and offers the urban relaxing space. 3 minutes walk from Nanba subway station, exit 14. 10 minutes from Honmachi exit of Hanshin expressway. Another 10 minutes en route Midosuji. Offering a favourable location and relaxing atmosphere, this attractive property is the right choice of accommodation, while visiting Osaka. Located on the famous Midosuji Avenue, the Cross Hotel is in the heart of the entertainment district of Osaka Minami Area. This property is 5 kilometres from the train station and 54 kilometres from the airport. Auspiciously housed and offering luxurious accommodation, the Plaza Hotel is an ideal place for an enjoyable stay in Osaka. Located in the city of Osaka, this property is just 10 minutes drive from the JR Osaka Train Station and about 50 minutes drive from the Kansai International Airport. 1 minute walk from JR/Subway Tennoji station. 1 minute walk from Osaka Abenobashi station on Kintetsu Minami Osaka line. 5 minuets by car from Tennoji IC on Hanshin expressway, Matsubara route. Near to JR/subway Tennoji station, 30 minutes JR train ride to Kansai International Airport, 30 minutes direct bus ride to Osaka Airport, 25 minutes subway train ride to Shin-Osaka. A very convenient city hotel for sightseeing and business. We provide comfortable guest rooms, as well as Japanese/Western/Chinese gourmet restaurants. Located in Esaka, this hotel is 1.8 mi (2.8 km) from Hattori Ryokuchi Park and 1.8 mi (2.9 km) from Open Air Museum of Old Farmhouses. Osaka Science Museum and Osaka Castle are also within 6 mi (10 km). This hotel is located at Esaka, the new face of Osaka, which is truly a strategic transport point. By taking the Subway Midosuji Line, which is the 'foot of Osaka�h, Esaka is within 4 minutes from Shin-Osaka Station and within 10 minutes to Umeda. In addition, the area is close to Osaka Airport. Guestrooms are simple and subtle for a relaxing stay. Providing a relaxing atmosphere and excellent service, this property is an ideal accommodation spot in Osaka for all types of travellers. Located in the heart of Osaka, the Rihga Grand Hotel is a short walk to many famous cultural and artistic attractions like Festival Hall as well as City Hall. This property is a kilometre from the Kita Shinchi Train Station and 30 kilometres from the airport. Featuring luxurious accommodation and impeccable services, this property welcomes you for an unforgettable vacation. Loacted a kilometre from the Shin Fukushima Train Station, the Rihga Royal Hotel is 2 kilometres from the city centre and 30 kilometres from the airport. The city attractions include Central Public Hall, Osaka City Hall and museum. Located in Chuo, this hotel is within 1 mi (2 km) of Nakanoshima Park, Osaka Science Museum, and Osaka Museum of History. Osaka Castle and Mint Museum are also within 2 mi (3 km). 7 minutes walk from JR/Subway/Nankai-line Namba Station. 8 minutes walk from Nipponbashi Station. Nestled in the central area of Minami, Osaka, Hotel Vista Grande Osaka offers superior service and hospitality in a comforting tranquil atmosphere. Hotel Vista Grande Osaka is the top ranked hotel amongst the Vista group hotels. Located in Soemoncho, at the centre of Minami, Osaka, Hotel Vista Grande Osaka is a perfect location for business or leisure travel. Stepping in from the bustling city, you will suddenly find an amazingly tranquil atmosphere with simple and modern interior. Located in the Umeda business-and-entertainment district, this Osaka hotel is 0.6 km (0.4 mi) from Umeda Sky Building, with its Floating Garden Observatory. The JR Osaka station is a five-minute walk. The Hotel Monterey Osaka is a European-style hotel whose motif is the city of Vienna, Austria. Situated at Nishi-Umeda in Osaka, it is an urban resort hotel. Providing all the convenient facilities, Dai-ichi Hotel Osaka is an ideal accommodation spot for leisure as well as business travellers. Centrally located, this elegant property is only a 2-minute walk from JR Osaka Train Station and about 20 minute drive from the Osaka International Airport. The hotel is also close to the Umeda and Nishi Umeda train stations. Connected to Subway Benten Station. Situated in the vicinity of an aquarium, Hotel Osaka Bay Tower is a 51-story city resort hotel and a landmark with amazing view from 200 meters above sea level and superior features. The Osaka Dome is located a 7-minute walk from Taisho Station, one stop over from JR Bentencho Station with which the hotel is directly linked. USJ is located a 15-minute walk from the same station. 5 minutes walk from JR Osaka Station. 5 minutes by car from Umeda ramp. Conveniently housed in the heart of Osaka and presenting cosy accommodation, the New Hankyu Hotel Osaka is an ideal base for both businessmen as well as tourists. Located in Osaka, the New Hankyu Hotel is close to banks, shopping centres and restaurants. In addition, the Osaka business district and all tourist destinations of Osaka as well as Kyoto, Kobe and Nara are situated close to the hotel. Located above the JR Osaka Station in the Umeda business and commercial district, the hotel is a 5-minute train ride from the Shin-Osaka station and a 10-minute ride from Universal Studios Japan. A city hotel equipped with an entire spectrum of urban functions, the Hotel Granvia Osaka is directly linked to JR Osaka Station. 100% ratings for convenience and comfort equals a 200% rating for the joys of travel. This city hotel is proud of its optimal location made possible through its direct linkage to JR Osaka Station. 1 minute walk from JR Universal City Station. Hotel Keihan Universal Tower is an official hotel directly tied to Universal Studios Japan and located close to JR Universal City train station. It is recommended to the wide range of generations for its rooms filled with sunlight and airy spacious lobby. The Sky Restaurant on the 32nd floor and the open-air bath on the 31st floor command a view of the whole Osaka Bay area. 10 minutes walk from JR Osaka Station. 1 minute walk from Oebashi station on Keihan Nakanoshima. 5 minutes walk from subway Yodoyabashi Station. 5 minutes from Umeda IC on Hanshin Expressway. 30 minutes from Ikeda IC on Chugoku Expressway. ANA Crowne Plaza Osaka is located in the center of Osaka. Very convenient for visiting both on business and sightseeing purposes. Yodoyabashi is one of the leading streets for office buildings and Kitashinchi is one of the best places for socializing. Our location is indeed a great base for discovering and exploring Kobe, Nara and other Kansai regions. Magnificently designed, the Sheraton Miyako Hotel Osaka provides a relaxed and comfortable sanctuary in the heart of the bustling metropolis Osaka. Perfectly situated in downtown Osaka, this property is close to the shopping centres and the area attractions that include the Kuromon Market, Osaka Municipal Museum of Art, Namba Entertainment District, Bunraku Puppet Theatre, National Bunraku Theatre and many more. 2 minutes walk from Universal City on JR Yumesaki line. 2 minutes walk from Universal City station. 5 minutes from Universal City on Hanshin Expressway Wangan line. Arrive at the hotel and you're just a stone throw away from the gate! This is an official hotel of Universal Studios Japan and the closest ever! The interior of this hotel was designed to correspond to an image of the park. Excitement and stimulation abound! Universal Studios store is located inside the hotel. 5 minute walk from Exit 2 of Higobashi Station on the Yotsubashi subway line. 10 minutes by pick-up bus from JR Osaka station, Sakurabashi exit. 10 minutes by car from Fukushima exit on Hanshin Expressway No.11 Ikeda route. Opened in 2014, located in the center of Osaka Nakanoshima, where Osaka Festival Hall and the National Museum of Art Osaka are close to. The location is convenient for business, sightseeing, and shopping. All of the guest rooms are spacious with more than 22‡u equipped with toilet, bath and wash basin are all separated. The 15th floor is the ladies rooms only, the 16th floor the top is equipped with a large garden type bath. 1 minute walk from the north exit of JR Shin Osaka station. 1 minute walk from No.1 exit of subway Shin Osaka station. 30 minutes by car from Suita IC on Meishin expressway. Conveniently located as a base for the business and sightseeing. The latest mobile facilities are available in all the guest rooms of 332. There are 3 restaurants, bars, meeting rooms and fitness gym. Located in Dotonbori, this hotel is within 1 mi (2 km) of Osaka City Air Terminal and Shinsaibashi Shopping Arcade. Tsutenkaku Tower and Shitennoji Temple are also within 2 mi (3 km). Set amidst distinguished ambience and offering an elegant environment in each of the comfortable room, the Nikko Hotel is a popular option for travellers desiring to relax in more spacious surroundings. Situated in the suburbs of Nishi-Shinsaibashi in the city of Osaka, the Nikko Hotel faces the tree-lined Mido-suji Avenue, which is the city's main boulevard and home of all headquarters of major corporations. 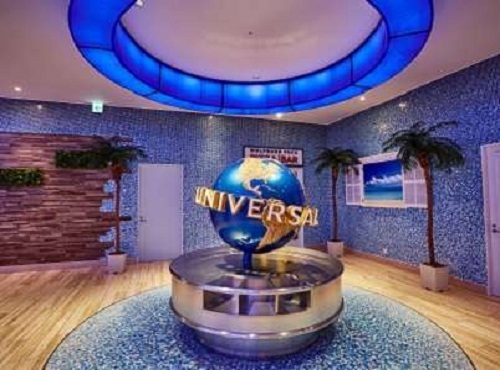 Hotel Keihan Universal City is an official hotel directly tied to Universal Studios Japan. The exterior of the building, which was designed based on a Hollywood art deco motif, is especially distinctive for its blue and yellow tropical color scheme. The interior of this hotel features space for dreams to be played out according to stories found in Hollywood films. All rooms are equipped with communication lines for computers and the use of such lines is permitted free of charge. New Otani Hotel Osaka features superb location, comfortable accommodation as well as convenient leisure and business facilities to make your stay in downtown a pleasant one. This property is conveniently located in the heart of Osaka, adjacent to the historic Osaka Castle Park, minutes from shopping and business districts. The hotel is at easy access via public transportation to sightseeing areas in Kyoto, Kobe and Nara. Namba Oriental Hotel is located in the heartland of Osaka -minami, and easy access to the business, sightseeing, and shopping area. Room interior are an elegant design equipped queen-size beds ,large sofas and a wide bathtub. Rooms are spacious at a low price. The access to airport is also convenient. 1 minute walk from Universal City station on JR Yumesaki line. 5 minutes from Universal City on No.5 Wangan line of Hanshin Expressway. Hotel opened on August 2015 as a luxury hotel run by Tokyu Hotels, standing in front of the main gate of Universal Studios Japan!! The 28-storied building is constructed with American Art Deco outlook. Most of the guest rooms are designed with the image of American cities! The top floor is the luxury floor, providing rooms with good view bath to the park. Enjoy your stay at the hotel, continued from the dream of joy at the park. Directly connected with Nankai Railway Namba Station. 3 minutes walk from Kintetsu and Subway Namba Station. 5 minutes from Namba exit on Hanshin Expressway. 10 minutes from Dotonbori exit/Minatomachi exit on Hanshin Expressway, another 10 minutes en route Midosuji. Midosuji-avenue is the major boulevard connecting between north and south of Osaka. Origin of south is Namba, and it is a leading town of culture and business in Osaka. Swissotel Nankai Osaka is a strikingly high-tower international city hotel located in Namba as the gateway to the south. It is directly connected to Namba Station via Subway Midosuji Line and Nankai Railway Line. Located in Kita, this luxury hotel is within a 15-minute walk of Umeda Arts Theater and Umeda Sky Building. Osaka Science Museum and Mint Museum are also within 3 mi (5 km). Hotel Hankyu International is located in downtown Umeda, Osaka and has totally 168 spacious and calmly rooms. Guests will be surely satisfied with the wonderful views from the rooms all on the 26th floor or above. There is a comfort and relaxation only those with the highest quality. Located in Kita, this romantic hotel is within a 5-minute walk of Floating Garden Observatory and Umeda Sky Building. Osaka Science Museum and Mint Museum are also within 3 mi (5 km). 2 minutes walk from the JR Osaka station. 5 minutes by car from Umeda exit on Hanshin expressway. Standing in front of JR Osaka station, having a good access for sightseeing, shopping and business. A view from the guestrooms is awesome. In the Umeda district, this modern high-rise is connected to a major shopping center. The Umeda Sky Building, Tempozan Harbor Village Ferris Wheel, and Osaka Aquarium are within 0.7 km (0.4 mi). Providing all the modern day comforts, Imperial Hotel Osaka welcomes you for an unforgettable stay. The hotel is about 10 minutes drive from Umeda, the heart of Osaka and is only a five-minute walk from the nearest station, JR Sakuranomiya. This location is ideal for anyone wanting to get out of the busy district of the city. 3 minutes walk from Naka-futo Station, New Trum Nanko Port Town Line. 5 minutes by car from each exit of Nanko-kita or Nanko-minami on the Hanshin Expressway. Located in Suminoe, this luxury hotel is within 1 mi (2 km) of Intex Osaka and Osaka Maritime Museum. Osaka Prefectural Government Sakishima Building and Port of Osaka are also within 15 minutes. Hyatt Regency Osaka is 28 stories building and has total 480 guest rooms. The hotel is located in Cosmos Square of Osaka Nanko, and also adjoins large-scale convention complexes and leisure facilities such as Intex Osaka, ATC and WTC Cosmo Tower. Guest can relax with a dynamic, dramatic and spacious harbor view from the room. 1 minute walk from JR Osaka Loop Line Tennoji Station. 0 minute walk from the subway Midosuji Line Tennoji Station. 5 minutes by car from Tennoji exit on Hanshin expressway No.14 Matsubara route. Opened in 2014, cooperated with International Hotel Brand known as "Marriott International" and Miyako Hotels. As a high quality urban hotel providing luxury services and facilities, including restaurants where guests can enjoy "heavenly" night views, club lounges, meeting rooms, gyms, and luxurious 360 guest rooms. Osaka Marriott Miyako Hotel provides world class hospitality and traditional Japanese service. You can find most of all Hotels in Osaka. We hope you can find good hotel in this Page,"ALL Hotels in Osaka,Japan".